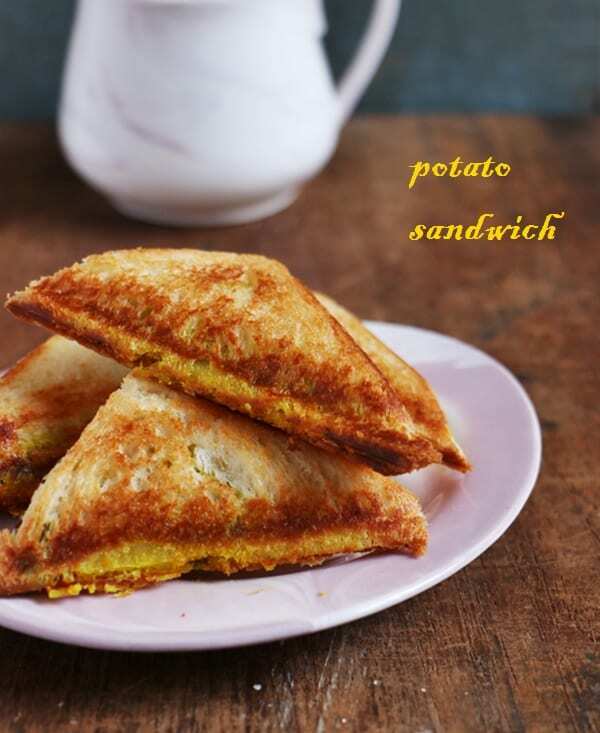 Potato sandwich recipe or aloo sandwich recipe with step by step photos. Today I am sharing a very easy to make delicious and filling, all time favorite dish for toddlers and kids. This is a cooked potato sandwich recipe. I mean the filling used for this aloo sandwich recipe is a quick potato peas masala. The masala used is a real quick recipe, no onion garlic, not even green chillies or ginger is needed for this filling. This is however my way of making potato sandwich recipe, you can add onions or ginger garlic paste or even carrots in this filling. To make potato sandwich recipe you can use white bread or wheat bread or multigrain bread. I have used white bread in this recipe. When serving for toddlers and kids you can use butter to toast the sandwich otherwise you can use oil or even dry roast the filed sandwich. Here I have used my sandwich maker to toast the sandwich. You can use a sandwich maker, grill if you have one or toast the sandwich in a hot tava. Serve potato sandwich hot immediately or you can even cool it slightly and pack in a tiffin. It will stay good and crispy. here is how to make potato sandwich recipe or aloo sandwich recipe. 1. Boil, peel and mash one large potato. Boil 1/8 cup green peas along with potatoes. 2. Heat a pan and add 2 teaspoons oil. Add 1/2 teaspoons cumin seeds and let it crackle. 3. Add peas and saute well for few minutes. 4. Add mashed potatoes and mix well. Add salt, turmeric powder, chaat masala powder and pepper powder. Saute and cook for 4-5 minutes. 5.Take 4 bread slices and remove the edges. 6. Apply little oil or butter on all the slices. 7. Place 2-3 tablespoons of prepared potato filling on one slice and close with other slice. Repeat the same with 2 more bread slices. 8. Place the prepared bread on a preheated sandwich maker and toast till the sandwich turns crisp. You can alternately toast in a hot tava too. 9. Serve potato sandwich hot or cool slightly and pack in a tiffin. Potato sandwich recipe, quick and easy to make no onion garlic,filling potato sandwich. 1 large potato boiled,peeled and mashed. Boil,peel and mash the potato well. Heat a pan and add 2 teaspoons oil. Add mashed potato, salt and all the spice powders, Mix well and cook for 4 minutes. Take the bread slices and trim the edges. Place 2-3 tablespoons of prepared potato filling on one bread slice. Cover with another slice. repeat the same with remaining 2 bread slices. Toast the in a sandwich maker or tava until crisp. 1. You can use the edges of the bread for making bread crumbs. 2. You can add ginger garlic in the filling. Healthy and filling potato sandwich. Very neat recipe. Brilliant! It never occurred to me to use potato as a sandwich filling. Since my husband and I have stopped eating all animal products, I’m always on the lookout for sandwiches that I can pack for his lunch. Thank you.